I wish these words were more common outside the month of November. Don’t get me wrong. I love getting together with family, enjoying good food and remembering what we’re thankful for each Thanksgiving Day. I’m also glad that the world, for at least one day each year, thinks about the things they have in their life that they can be thankful for. I just wish it were something that more individuals considered every day of the year. 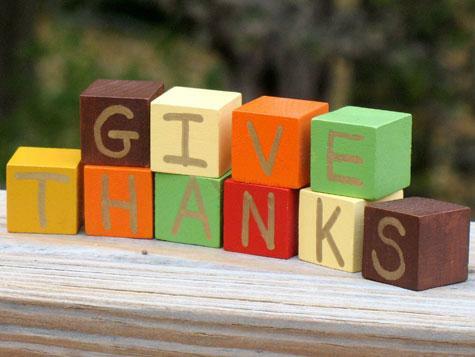 Being thankful is something that should be a part of a Christian’s life at all times. As the world celebrates Thanksgiving next Thursday, the focus of most people will be on the physical things that they have. Some will be thankful for family and friends. Others may be thankful for the daily provisions that they have. There’s nothing wrong with that. We should always be thankful for the physical things that God has blessed us with. As Christians though, I wonder sometimes if we overlook the spiritual blessings we have to be thankful for. Our prayers usually express thanksgiving for food, our homes and jobs. How often do we forget to thank God for those spiritual things that matter so much more? I want to encourage us to be thankful, each day, for a few things we may often overlook. Give thanks for Christ and His sacrifice. There is nothing in this world we should be more thankful for. Without Christ and His willingness to die for our sins, none of the other blessings we receive would matter. Regardless, we often forget to express our thankfulness for Jesus Christ. If we do remember, it’s usually something we throw in at the end of our prayer just so that we can say, “and it’s in His name that we pray. Amen.” I wonder how often we sit down to pray with the sole intent of thanking God for His Son and the great sacrifice that He made. When we are baptized into Christ, we come in contact with His saving blood. If He had never died, we would still be lost in our sins. For that, we should give thanks. Give thanks for the church. Too often Christians forget about the great blessing that the Lord’s church is for us. There are many Christians in certain parts of the world who would love nothing more than to be able to spend time with others from God’s family. Those of us who do have this opportunity often overlook this great blessing because we have become so accustomed to it. Ecclesiastes 4:7-12 reminds us how important a support system can be. We should be thankful for the fact that we have others with a common goal who can lend support and encouragement whenever we need it. Paul expressed his thankfulness for almost every church that he wrote to and spent time with. We can show our thankfulness for the church not only through our prayers but also by taking advantage of the opportunities we are given to fellowship and worship with the other saints (yes, that means not just Sunday morning). Give thanks for opportunities to share God’s word. Seen more as a chore than a blessing, the opportunity to evangelize to the world should be something we are thankful for. We have in our possession the greatest story that has ever been told: the Gospel. Sadly, evangelism has been painted by some as a job and not a blessing. It is becoming more and more rare that you would find a Christian who claims to really enjoy evangelizing. It’s something we should enjoy though. God can use us as a tool to bring others to Christ when we allow Him to. When you look at Paul and the other apostles, they saw preaching God’s Word as a great blessing that they were unworthy of. We should strive to do the same. Every time an opportunity arises to share God’s Word with someone, we should give thanks (and then take advantage of that opportunity). This next week as you gather with family, remember not only the physical blessings that you’ve received but all that God is doing in your spiritual life as well. Then, take these things into your everyday prayer life. God surely has blessed us with so much. This entry was posted on Wednesday, November 16th, 2011 at 3:26 pm	and posted in Evangelism. You can follow any responses to this entry through the RSS 2.0 feed. Thanks for this post and this reminder Jeremy. I needed this today brother. God bless and keep up the GOD work man. Great article Jeremy! Amen on every count!